and enjoy what each individual member of our WRJ brings. WRJ (Women of Reform Judaism), our sisterhood, is involved with all facets of life at The Reform Temple of Rockland. We are engaged in Tikkun Olam (repairing the world/social action) for Rockland County, our country and Israel. 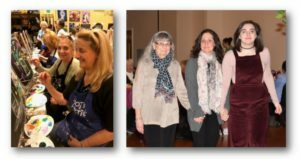 We get together for homemade meals, Paid-Up Membership Brunches, Women’s Seders, fun-filled fashion shows, the theater, supporting engaging demonstrations and programs, and distributing Purim bags, handmade comfort shawls and Mi Shebeirach bears to our Temple family. We provide food and funding wherever needed to help support our Temple. Our WRJ is a group of women who is determined to make our Temple and our world a better place. We need the support of everyone in temple to help to keep us successful. Visit our Judaica Shop for one-stop shopping to meet all of your gift and Judaica needs. We carry a stunning array of wedding, baby, home and B’nai Mitzvah gifts, as well as a spectacular selection of Kippot, Tallitot and Mezzuzot, as well as spectacular gifts for all occasions. Many products in our shop are made in Israel. Call Helayne Pfeffer at (845) 429-2939 or Renee Kratter at (845) 357-6715 for shop hours and to schedule convenient personal appointments. Visit the Judaica Shop page. Beautiful YES Fund (Youth, Education & Special Projects) cards are available as well as note cards, thank you cards, mazel tov cards, holiday cards and, of course, Uniongrams, Goldengrams and Silvergrams. Your contribution to the YES Fund ensures our Jewish heritage by fostering the next generation of leaders. Please contact Alicia Bader-Weisberg for more information and purchase. Do you have a college student? Keep your student close to the Temple family with our special surprise holiday treats. Please provide the Temple office with his/her e-mail, as well as college mailing address. Since most college students have a different mailing address each year, we need an updated address each school year, even if your student’s address has not changed. We do not reuse addresses from previous years. Make sure that your college scholar does not miss out. E-mail the information to Ruth Schlanger. This is just one of the many responsibilities of the Women of Reform Judaism at The Reform Temple of Rockland. Have you join our very popular theater group? We are a group of over 200 women and men with a love of the theater. we see the latest of Broadway in excellent seats, at great savings, while at the same time supporting the “Women of Reform Judaism”. the plan is to see six shows a year – three in the Fall and three in the Spring. We do not schedule any shows during the Winter to accommodate our “snow birds.” We will be accepting applications again after June 1, 2018. Treat yourself to a wonderful experience. Email Eadie Kanchuger, she will be happy to give you all the details.